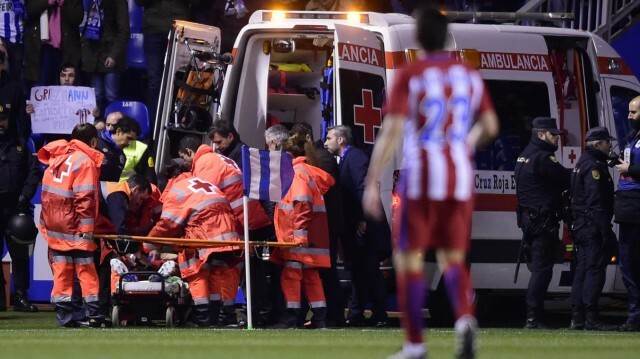 HomeTrendingFernando Torres ‘horror’ Head Injury at Atletico match vs. La Coruna! Fernando Torres who suffered a head injury in the game Atletico Madrid vs. Deportivo La Coruna can make football fans to feel the pain. Why not? Incident ‘horror’ that befell Torres after he lost the aerial duel against Alex Bergantinos. El Nino fell to the ground so hard with the position of the body face down. After being taken to the hospital, Atletico Madrid confirmed that Torres is in stable condition and conscious. This terrible incident happened at 85 minutes when the score tied at 1-1. In an attack La Coruna raw, Fernando Torres aerial duel with Alex Bergantinos. But the Spain striker off balance, and immediately roll with the head first hit the ground. Fortunately, the reaction of the players Atletico and La Coruna fast enough. They turned Torres and tried to give first aid. Fernando Torres rushed immediately to the hospital. However, panicked Diego Simeone who repeatedly blame the match officials, plus pale Jose Maria Gimenez almost cried, these can make us guess how bad and the worst that could befall of El Nino. This nudge continued with the positive development of the injury. After undergoing a CT scan found no traumatic injury to Fernando Torres. He also was able to speak. Nonetheless, doctors provided appropriate medical protocols; El Nino spent the night for observation.